FAQs | PlayTrain Positive Dog Training - You Name it! We Tame it! When Can I Start Training? Immediately! The truth is, no matter what your dog’s age, he’s learning the minute he walks into his new home. His human family’s reactions give him feedback about what works in this new environment to get the things he wants. Why let unwanted behaviors turn into bad habits that you then have to “fix?” PlayTrain will show you how to shape his behaviors into the good doggie habits that will stay with him for life. We have training programs for all stages of development: puppies, adolescents and adult dogs. What Should I Look For In a Trainer? What is the CPDT-KA Credential? CPDT-KA. (Certified Professional Dog Trainer- Knowledge Assessed.) The CPDT-KA is an internationally recognized credential in the field of dog behavior & training. In an unregulated industry, trainers who obtain these credentials do so voluntarily, demonstrating their desire to be the best that they can be. What is the Fear Free Certified Professional Credential? This 8-module on-line course teaches veterinary hospital staff and other pet care professionals how to “reduce or remove anxiety triggers that cause pets to become fearful at home, in transport and at the veterinary hospital.” Our goal is to recognize, alleviate and prevent the signs of FAS (Fear, Anxiety and Stress) in animals in our care. 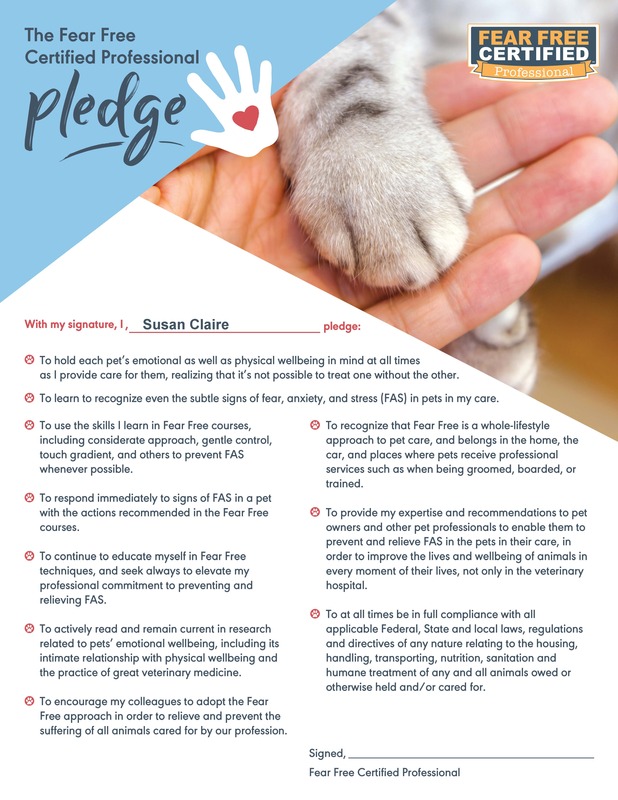 The FFCP pledge includes “recognizing that Fear Free is a whole-lifestyle approach to pet care, and belongs in the home, the car, and places where pets receive professional services…” I’ve also pledged to” provide my expertise and recommendations to pet owners and other pet professionals to enable them to prevent and relieve FAS in the pets in their care in order to improve the lives and wellbeing of animals in every moment of their lives…” Please read the full pledge here and visit Fearfreepets.com for more info. What Kind of Training Philosophy Can I Expect? Let’s face it: your dog is a member of another species and you’ve invited him to live in your home! Now it’s up to you to teach him the human rules. Until we humans translate and demonstrate what our words mean, it’s all just gibberish to dogs! When you learn and embrace the simple behavior theories that apply to all animal learning, you start to see opportunities to shape your dog’s behavior in every interaction you have. Your dog is not trying to dominate you or take over the house; he’s just trying to see what works to get the things in life he needs. And dogs only do what works. It’s our job to make sure “good” behaviors “work” to get the dog what he wants! And since all resources come from you, you are in a position of great power. PlayTrain will show you how to use that power to your advantage. What is R+ (Positive Reinforcement)? You CAN teach your dog without hurting him. Marine mammal trainers have known this for years. You will learn how to use food, play, praise, touch and other “life rewards” as reinforcers. These modern, humane training methods are known as positive reinforcement. R+ training focuses on what your dog is doing right. Your dog is taught and rewarded for desirable behavior, increasing his likelihood to repeat it. Undesirable behaviors are prevented, ignored and re-directed, making them unsuccessful for the dog. Positive training is not punishment-based. No choke chains, prong collars, shock collars or leash corrections are necessary. The result is a dog who obeys with enthusiasm, not fear. PlayTrain believes that the use of physical punishment is unprofessional, unethical and unnecessary. Punishment such as choking or shocking a dog can temporarily shut down a behavior, but does not teach good behaviors and may create new problems such as fear, anxiety, distrust and aggression. “The adverse effects of punishment have been well-documented. Punishment has been shown to elicit aggressive behavior in many species of animals. Thus using punishment can put the person administering it or any person near the animal at risk of being bitten or attacked. Perhaps one of the most compelling reasons to use punishment sparingly is that punishment fails to address the fact that the bad behavior is occurring because it has somehow been reinforced- either intentionally or unintentionally.” (American Veterinary Society of Animal Behavior Guidelines on the Use of Punishment for Dealing with Behavior Problems in Animals). What About “Dominance” and Being “Alpha”? These terms are derived from a long-debunked myth about dog behavior as it relates to wolf behavior. Faulty research in the 1930’s was responsible for developing this theory about the “Alpha Wolf” dominating all others and fighting for resources. Renowned wolf expert, Dr. David Mech, long ago debunked this theory. In the decades since, the scientific community has gained more understanding and clarified its views on the subject. Wolf packs in the wild consist of family units in which the parents teach and nurture their puppies. They thrive due to their deep social bonds and cooperation, not as a result of dominating and fighting for resources. Sadly, popular culture continues to perpetuate misinformation, resulting in inappropriate treatment of dogs. Behavior problems that owners seek help with “… occur because they have been inadvertently rewarded and because alternative appropriate behaviors have not been trained instead. Consequently what owners really want is not to gain dominance, but to obtain the ability to influence their pets to perform behaviors willingly- which is one accepted definition of leadership.” (Knowles and Saxberg 1970, Yin 2009). Does My Puppy Need All his Shots to start Puppy Kindergarten? Your puppy needs to have his second parvo/distemper/corona virus booster to start Puppy K. He also needs to be in your home for 10 days to be sure he doesn’t have parasites or kennel cough. Waiting until he’s had “all his shots” is not recommended, as the primary socialization period will usually be over by that time. “The American Veterinary Society of Animal Behavior believes that it should be the standard of care for puppies to receive socialization before they are fully vaccinated. Because the first three months are the period when sociability outweighs fear, this is the primary window of opportunity to adapt to new people, animals and experiences. Incomplete or improper socialization during this important time can increase the risk of behavioral problems later in life including fear, avoidance, and/or aggression. Behavioral problems are the number one cause of relinquishment to shelters. Behavioral issues, not infectious diseases, are the number one cause of death for dogs under three years of age.” (AVSAB Position Paper on Puppy Socialization). As a CPDT-KA, I sign a code of ethics, which includes refraining from offering guarantees regarding outcomes in training. It is considered unethical to give clients a guarantee, since both you and your dog are separate, sentient beings, and no one can guarantee the behavior of another living creature. However, my commitment to professional excellence, continuing education and superb customer service give you the assurance that you will be getting the most up-to-date information from a professional who uses only best practices in her field, and is dedicated to force-free, humane training. You will be treated with courtesy, honesty and punctuality. Your dog will be handled in a humane, compassionate way that always puts his physical and emotional well-being first. All lessons include written handouts that you can refer to, and share with your family. I am also available by phone or email for follow-up, between lessons or after our work is complete, should you need it. Recommendations will be made so that you are using the right tools for training your dog, and suggestions for further reading are also provided. As is true with any educational experience, your results will depend upon your commitment to practicing and implementing the techniques you are taught. To see what previous PlayTrain clients have to say, visit my Yelp listing.